The 105th edition of the world’s biggest cycle race – #TDF2018, #LeTour – has been announced and we are ready for it, though somewhat surprised by the route! Though it’s the shortest Tour de France this century – at around a total distance of 3,300 kilometres – it is going to mean covering some big driving distances to keep up with it! Unlike most Tour routes, the 2018 version hardly tracks north to south at all, instead going almost exclusively east to west in northern France, then west to east in the south, with a big commute between the two very disconnected parts. It will take some strategic planning to find the right balance between trying to see it all and being able to get ahead of it and in position to actually watch the stages. However, we know this will not deter our fanatical Tour fans from following it in a campervan. Typically, once the route is announced all of our campervans and motorhomes fill quickly (as do the other hire fleets in France and neighbouring countries). 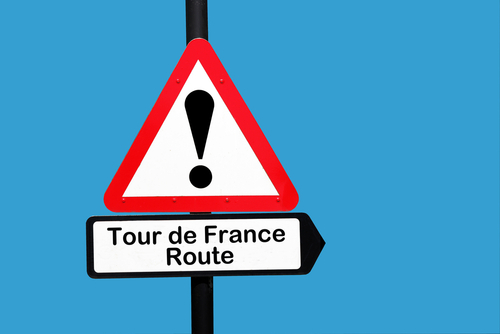 An estimated 10,000 motorhomes follow Le Tour each year…if you want to be in one of them you should book now! We will be updating the information on our Tour de France special packages page in the coming days. In the meantime, you can see our full Tour Package Special here. ← Be spontaneous… Book a motorhome getaway this October!